Read-out Instrumentation Signpost: Indoor air quality. As a Health Safety and Environmental Consultant, Matthew Brown has experienced increased numbers of enquiries from organisations looking to investigate indoor air quality because of its effects on staff health and performance. 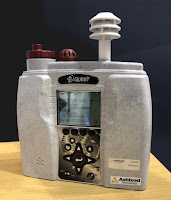 Such work involves the monitoring of multiple parameters, and in a recent example Matthew rented a TSI QUEST EVM-7, one of the latest indoor air quality monitors from Ashtead Technology. With no natural ventilation in the building, air quality was controlled by a heating ventilation and air conditioning (HVAC) system, and Matthew spent around 6 hours surveying the locations most likely to present air quality problems. Some of the staff had suggested that they may have received infections from the air, so in addition to the data provided by the instrument, Matthew also took samples for subsequent microbiological analysis. The TSI QUEST EVM-7 is able to run from an internal rechargeable battery for up to 8 hours, monitoring Temperature, Relative Humidity, Air Velocity, Particulates (PM2.5, PM4, PM10 or TSP) Carbon Dioxide and VOCs. A separate toxic gas sensor provides the option of Carbon Monoxide, Chlorine, Ethylene Oxide, Hydrogen Cyanide, Hydrogen Sulphide, Nitric Oxide, Nitrogen Dioxide, Oxygen or Sulphur Dioxide. The instrument also features an internal datalogger and a sampling pump if offsite analysis is required. A large display with intuitive control enables rapid set-up; choosing logging and averaging rates for example. The display also allows the user to view trend graphing for measurements. As a Gold Channel Partner for TSI Instruments, Ashtead Technology operates a fully equipped service and calibration laboratory from its facility in Sandy, Beds. 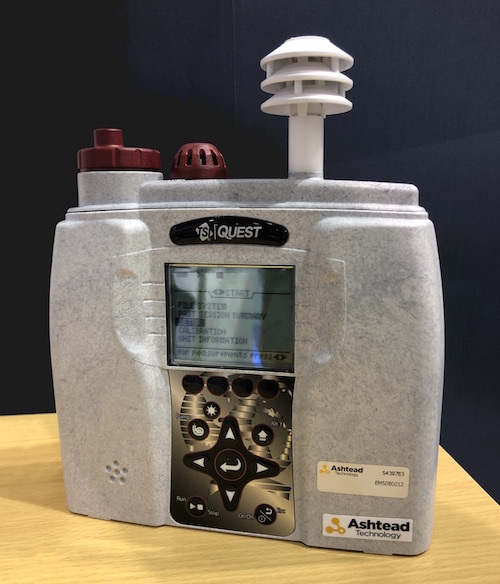 As a result, Ashtead is able to ensure that these instruments, including the QUEST range, operate to their full capability. Data from the instrument were compared with workplace exposure limits and were found to be acceptable; as were the microbiological results reported by the laboratory. However, Carbon Dioxide levels rose during the day, so it was recommended that flow rates should be increased in the afternoon. The building itself was 15 years old, so it was recommended that an assessment should be undertaken to check that the building management system was designed for, and able to cope with, the current level of occupancy. It was also recommended that the operation, maintenance and cleaning of the building management system should be better documented so that the organisation could demonstrate defensible processes if called to do so. Commenting on the advantages provided by the QUEST EVM-7, Matthew says: “I know that Ashtead offers this instrument for sale, but for me it was more cost-effective to rent the unit for this small project. “The instrument arrived clean, calibrated and ready for immediate use with an easy-to-use start-up procedure, and the ability to monitor such a wide variety of parameters with one lightweight instrument, meant that the whole job was simple to perform.